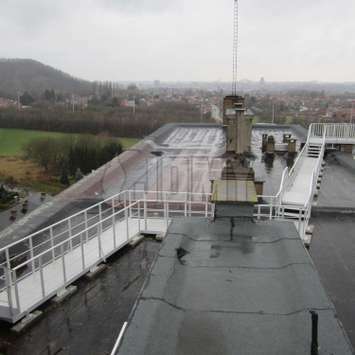 The ideal solution for easy and safe passage at height. 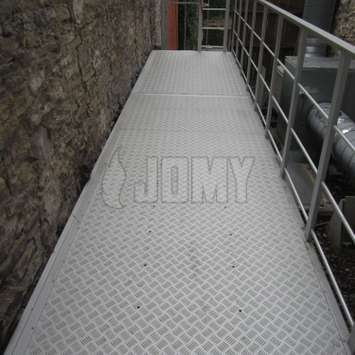 JOMY offers different types of walkways: fixed, suspended, self-supported, custom made,… Many options are also available. 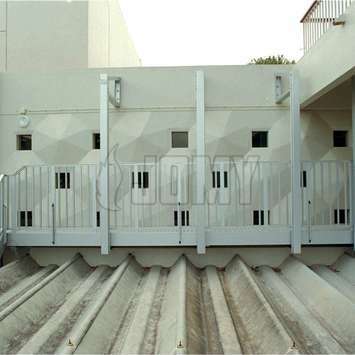 All JOMY walkways are made ​​from anodized aluminum profiles. They are composed of standard elements, designed for easy installation and allowing great flexibility in mounting forms. 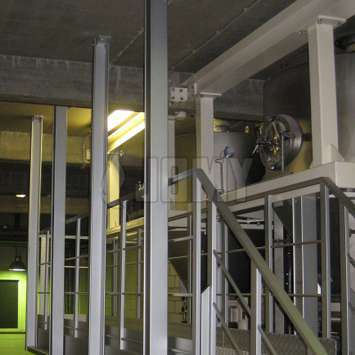 JOMY Walkways can have a suspended or freestanding structure. 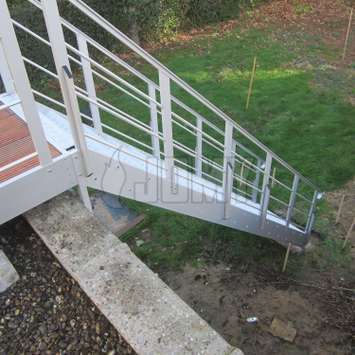 Different types of railings, floors, and RAL colors are available. Fixed JOMY walkways bridge distances at heights and allow for safe acccess to escape ladders and stairs. 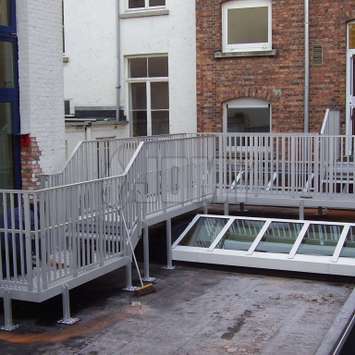 JOMY walkways are constructed from standard components, adapted to the building in accordance with the safety requirements. 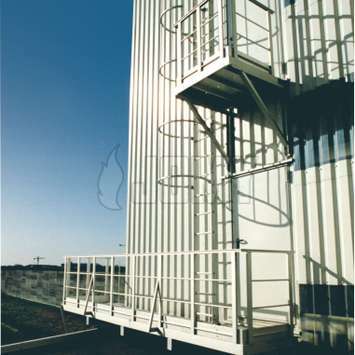 All JOMY walkways are produced from anodized aluminum profiles and designed to be robust and solid for use in industrial environments. 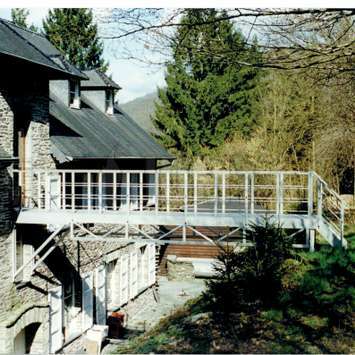 The walkways may be self-supporting or suspended. 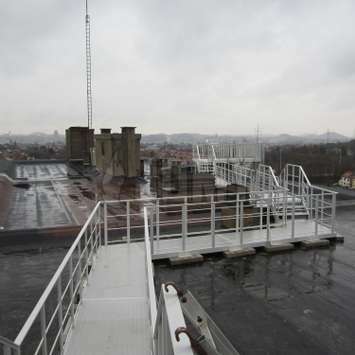 Guardrails are provided to protect against falls. 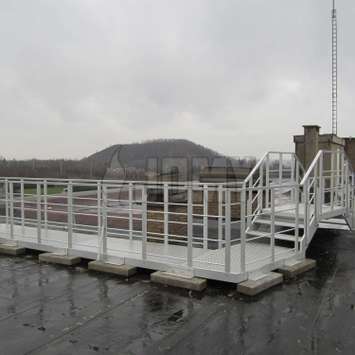 Many types of guardrails, flooring, access gates, RAL colors, and other customizable options are available. 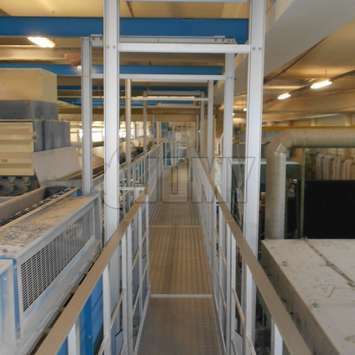 The choice of flooring can be influenced by your requirements to avoid accumulation of water, ice, snow, or dirt. 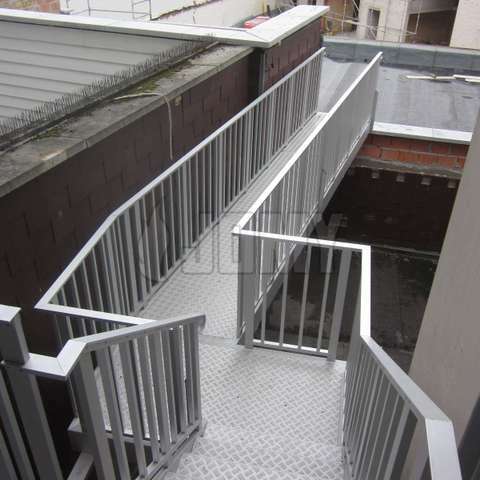 Walkway dimensions vary according to mechanical requirements and necessary carrying capacity for your specific needs. 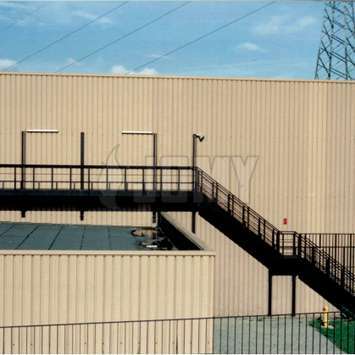 Our JOMY Guardrails are robust and solid, designed to provide fall protection in industrial environments. They are built from aluminum alloys, and can be designed with or without surface treatment. They can be anodized with a protective surface treatment or with epoxy powder coating in any desired RAL color. 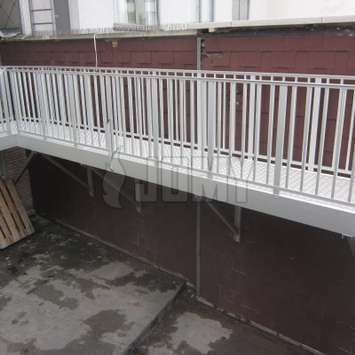 We offer several types of guardrails including custom guardrails with a combination of handrails, pickets, intermediate guardrails, skirting-boards, baseboards, etc. 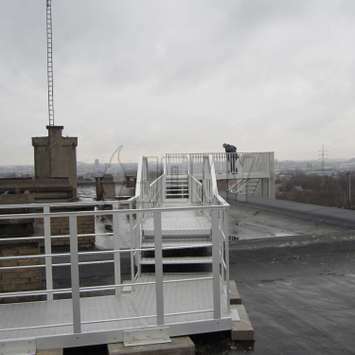 All guardrails can be designed according to agreed specifications. 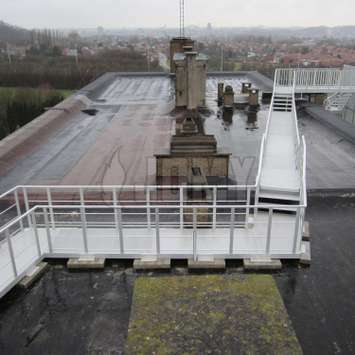 Depending on the building, we propose several walkway configurations. Classic self-supporting walkway structures will be mounted on supporting columns. 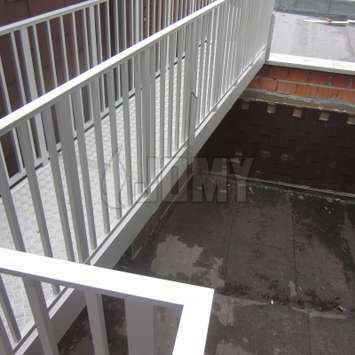 All JOMY walkways are constructed from aluminum profiles. This lightweight material makes it possible to mount the walkway on brackets to create suspended support structures. 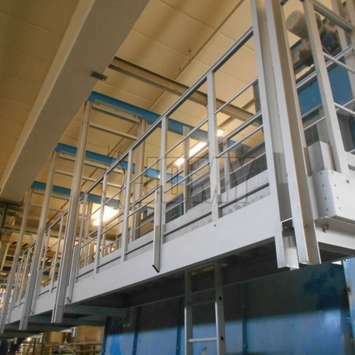 When a walkway is suspended from above, it is mounted with support arms to the ceiling or to the wall from above. 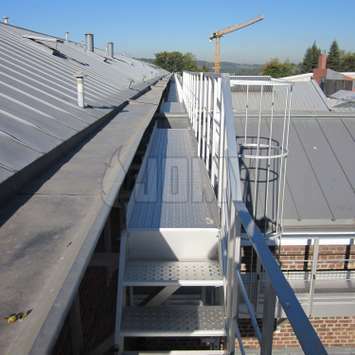 JOMY walkways are constructed from standard components, adapted to the building in accordance with safety requirements. 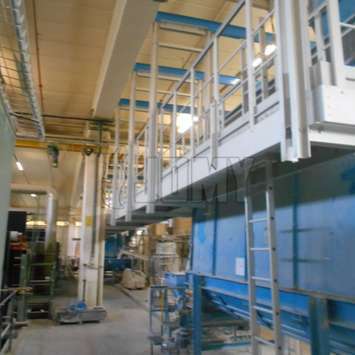 Walkways are modular and bolted together like a meccano set. 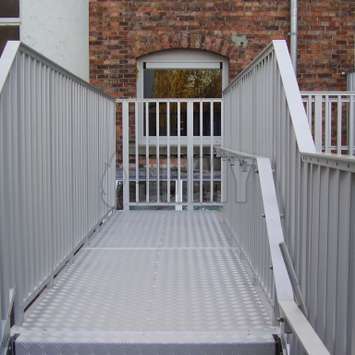 Walkways are supplied ready-to-assemble and designed for transport. 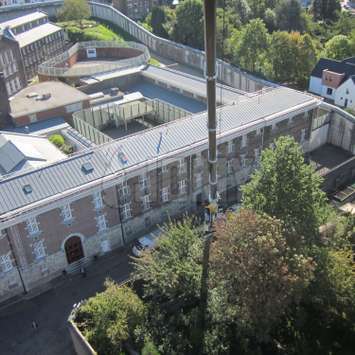 Classic self-supporting structures are mounted on columns. Classic suspended structures are mounted on brackets. Suspended from above structures are mounted on support arms. 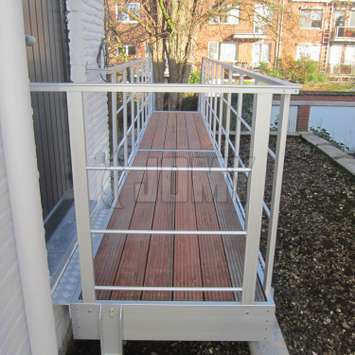 JOMY walkways are constructed from extruded anodized aluminum profiles (anodized with natural mat finishing) and are assembled with stainless steel fasteners. 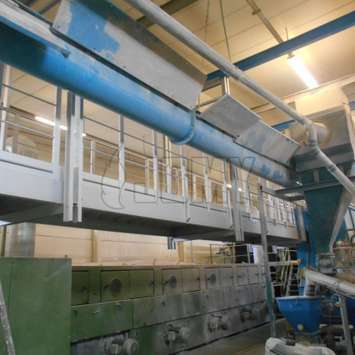 Factory polyester powder coating in any RAL color is available on request. 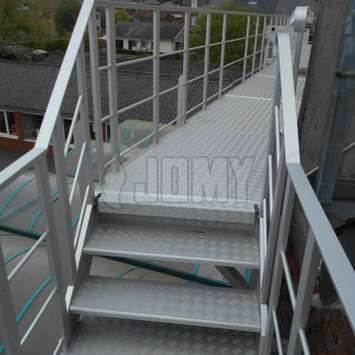 JOMY walkways are designed to carry a useful load of 102 lb/ft² or 500 Kg/m³. Fixed walkways are available in standard sizes for easy ordering and fast delivery. Bitte geben Sie alle Informationen an, die Sie zu diesem Zeitpunkt weitergeben möchten. Je spezifischer Sie sein können, desto besser können wir auf Ihre Anfrage reagieren. Zumindest möchten wir den ungefähren Standort Ihres Projekts wissen, damit die richtigen Personen Ihre Anfrage bearbeiten können. Pflichtfelder sind mit einem * gekennzeichnet. Alle anderen Felder sind zu diesem Zeitpunkt optional. Wo befindet sich Ihr Projekt? Ihre Anfrage. Bitte geben Sie wichtige Abmessungen und andere Informationen an, die Sie für nützlich erachten. Sie können eine Datei mit weiteren Informationen hinzufügen. Bitte beschränken Sie Ihre Dateigröße auf max. 10 MB. errorIhre Datei ist zu groß. Bitte beschränken Sie die Dateigröße auf 10 MB. errorEtwas ist schief gelaufen. Wir haben Ihre Anfrage nicht erhalten. Bitte versuchen Sie es erneut, oder wenden Sie sich direkt an uns. Vielen Dank für die Anfrage. Wir freuen uns über Ihr Interesse an unseren Produkten und werden uns in Kürze bei Ihnen melden. Sie sind nicht angemeldet. Melden Sie sich mit Ihrem Google-Konto an. Sie sind eingeloggt als: . Etwas ist schief gelaufen. Wir haben Ihre Anfrage nicht erhalten. Bitte versuchen Sie es erneut, oder wenden Sie sich direkt an uns.. Sie sind nicht angemeldet. Diese Seite verwendet Cookies. Durch die weitere Nutzung dieser Website oder durch Klicken auf "Ich stimme zu" stimmen Sie der Verwendung von Cookies zu. Was sind Cookies? Wir verwenden Cookies, um die Benutzerfreundlichkeit für unsere Besucher zu erhöhen und die Benutzererfahrung für jeden Benutzer individuell anzupassen. Durch die Verwendung von Cookies speichern wir Ihre Präferenzen und messen die Benutzerinteraktion. Ein Cookie darf keine persönlichen Informationen enthalten, keine Telefonnummer oder E-Mail-Adresse verknüpfen. Daher können Cookies nicht für unerwünschtes Telemarketing oder E-Mail-Newsletter verwendet werden. Weitere Informationen finden Sie in unseren Cookie-Richtlinien .